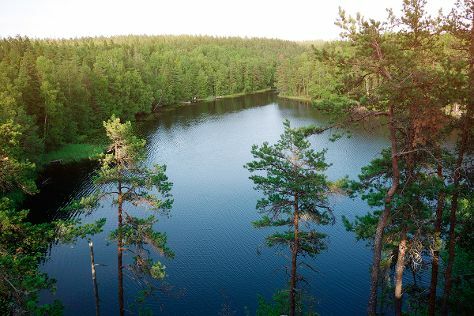 Get in touch with nature at Nuuksio National Park and Pornaistenniemi Nature Trail. Get some historical perspective at Rock Church and Uspenskin Cathedral (Uspenskin Katedraali). Next up on the itinerary: brush up on your military savvy at Sea Fortress Suomenlinna, take in the architecture and atmosphere at Helsinki Cathedral, appreciate the history behind Memorial to the Gustaf II Adolf Diet in 1616, and make a trip to The Esplanadi Park. To see other places to visit, ratings, more things to do, and tourist information, go to the Helsinki trip builder site . If you are flying in from Canada, the closest major airport is Helsinki Vantaa Airport. In October, daily temperatures in Helsinki can reach 10°C, while at night they dip to 1°C. Wrap up your sightseeing on the 13th (Sun) to allow time to travel back home.